Now available on your computer, tablet, or phone: your favorite shows and your favorite channels. WatchTVEverywhere is free to all Red River Communications Digital TV subscribers. You can watch your favorite channels and shows anywhere in the world as long as you have an internet connection. Nearly all WatchTVEverywhere channels and shows are available on your PC, tablet, or smartphone. WatchTVEverywhere is a service that allows Red River Communications Digital TV subscribers to view TV programs on devices other than a TV set. This can include a PC, a laptop, tablet or smartphone. How is it different from Hulu, Netflix, or other streaming services? It has full episodes of current shows. Some episodes of new shows are available within days of their premiere. Nothing! At this time, there’s no extra cost for WatchTVEverywhere, so feel free to explore. There is nothing on the site that will result in an extra cost to you (except overage charges from your cellular carrier, if applicable). 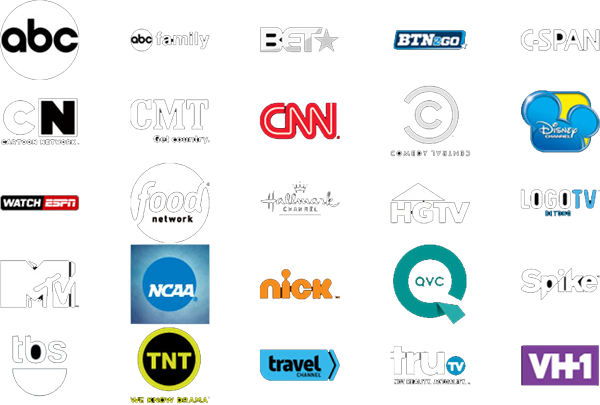 As long as you can receive the TV Network in your “regular” channel lineup, you may view that network’s TV Everywhere content, if available. WatchTVEverywhere works anywhere you can receive an Internet signal: in your house, at work, at the mall, at a hotel, the airport, a vacation home- anywhere! Wired connections and in-home WiFi will provide the best overall quality. The quality of WatchTVEverywhere service while traveling (airports, stores, etc) will vary with the signal strength and bandwidth of the Internet connection you use. Be extra careful when traveling, especially outside the U.S. Data roaming charges may apply, and they can be very expensive. Visit watchtveverywhere.com. Click “Log In” and enter your username and password. Click on the TV Network you want to watch, and you’ll see a list of available programs. You can watch any WatchTVEverywhere program as long as it’s on a network you subscribe to in your TV package. For example, you must subscribe to HBO through your Digital TV company in order to watch HBO’s WatchTVEverywhere programs. Nearly all WatchTVEverywhere programs are available on all devices (PC, laptop, tablet, smartphone). Some networks may not have made all their programs available on all devices. There’s no limit to the number of devices you can use, however TV networks may limit the number you can use at the same time. Remember, it’s important to keep your username and password confidential. Use of your credentials by others will result in the loss of your WatchTVEverywhere privileges. It might. Check your data plan before you use WatchTVEveryhwere on a smart phone or wireless network. WTVE programs transmit a lot of data. This can be expensive if you have a limited data plan. We have no way to know when you have exceeded your data plan’s limits and cannot take responsibility for any incremental charges made by your mobile carrier.